What happens when one of the most aesthetically pleasing fashion brands—with a continually sold-out It-girl bag, a flawless Instagram feed, and a cult following—opens a pop-up shop at the iconic Melrose Place in L.A.? An overload of resplendence in a striking space adorned with the label's most covetable pieces. Cult Gaia—the cool-girl brand that quickly garnered a loyal fashion girl fan base with its Gaia's Ark Bag and now boasts many more must-have handbags as well as limited edition ready-to-wear collections and statement accessories—is planting its roots in its hometown of L.A. with a gorgeous pop-up now through December 31. The temporary space exudes the California cool and effortless vacation vibes that have become the brand's signature, as well as Cult Gaia's brand-new Resort 2018 collection and other glimpses into designer Jasmin Larian's vision. "I wanted our woman to be able to enter our world, the way our team does every day in the studio, and our buyers do when they visit our showroom," Larian explained in a press release. "We put so much effort in our quality and materials, and can't wait for our customer to be able to touch and feel the collection." Head below to step inside Cult Gaia's gorgeous L.A. pop-up shop. 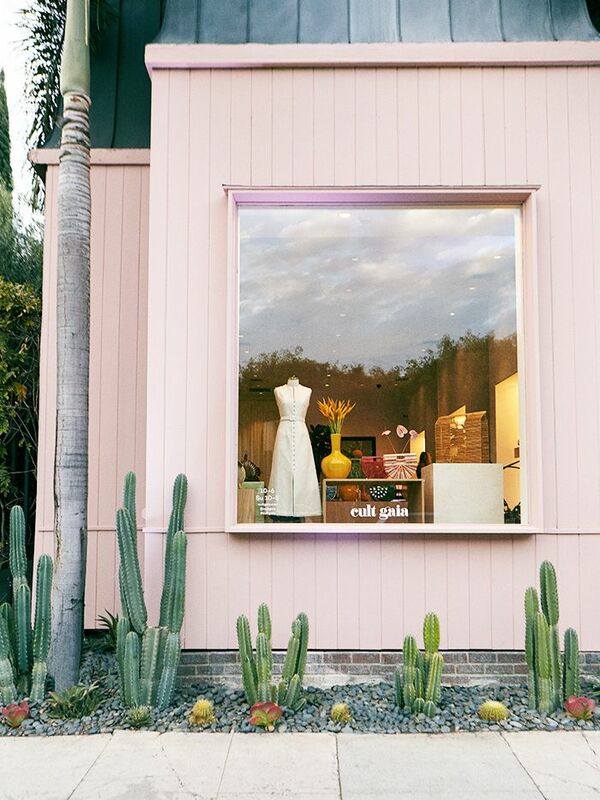 The light pink shop pops behind succulents in L.A.'s iconic retail destination Melrose Place. The store is entirely designed by Jasmin Larian and emulates the brand's core aesthetic. The brand's pieces continually sell out with their online stockists, so the physical space broadens the brand's retail vision while bringing to life the Cult Gaia world in an experiential way. The store provides the customer with everything she needs to build her wardrobe beyond the iconic Gaia's Ark Bag. Channeling the wanderlust appeal of its brand, Cult Gaia partnered with Assouline to dedicate a wall to luxury travel and resort coffee table books for guests to peruse. The cornerstone of Cult Gaia's DNA is creating heirloom items that are conversation starters. Coinciding with the launch of the pop-up on November 17, Cult Gaia debuted its 88-piece Resort 18 collection. Can't make it into the store? Shop some of our favorite Cult Gaia pieces here.